So it is no surprise that at least four of the five episodes in the series resonate with discard studies, all of which you can hear live7-8pm GMT on Resonance 104.4fm or catch later via a podcast in their archives. If libraries and archives have become the means for storing human history, where are geological histories stored? A frozen archive of geological and climatic records exists inside glaciers and ice sheets. This show will look at how scientists are able to use ice to decipher climatic and atmospheric histories. It will ask what role the polar regions play in the popular imagination, and ask how artists both store and form our image of the poles. Featuring: Dr. Emilie Capron, Paleoclimatologist at British Antarctic Survey; Esther Leslie, Professor in Political Aesthetics at Birkbeck University; Professor Chris Wainwright, Head of Camberwell, Chelsea and Wimbledon Colleges, and member of Cape Farewell; Stephanie Millard, Exhibition Project Leader at the Science Museum. The show will look at different burial practices, the difference between English cemeteries and European ones (think of Thomas Gray’s Elegy; Ugo Foscolo ‘I Sepolcri’ as a response to Napoleon’s 1804 Edict of Saint Cloud prohibiting burial within city walls); Catacombs, ossuaries, mass graves, what is their relevance and use today? Ghanian coffins: would it not be more fun if everyone was buried in them? What is the significance of burying the dead? How does this affect the ethics of burial and in what cases are these overridden and why? Have burial practices significantly changed over time? 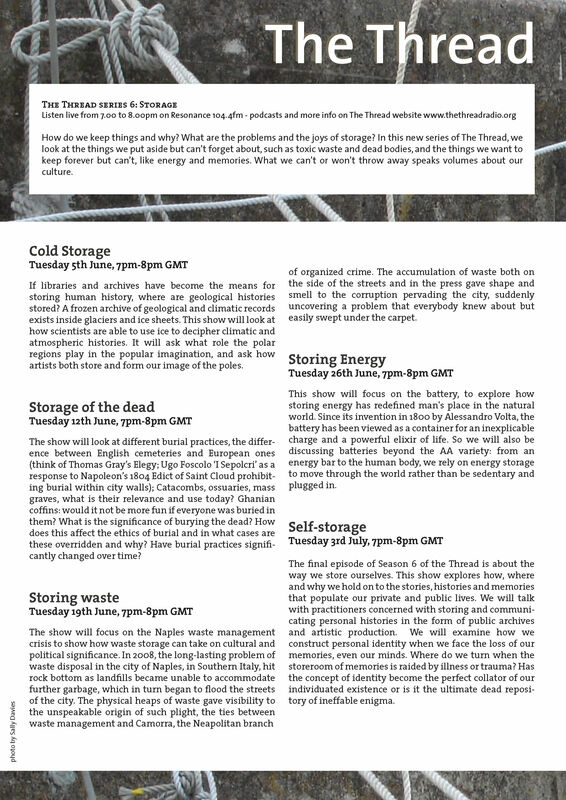 The show will focus on the Naples waste management crisis to show how waste storage can take on cultural and political significance. In 2008, the long-lasting problem of waste disposal in the city of Naples, in Southern Italy, hit rock bottom as landfills became unable to accommodate further garbage, which in turn began to flood the streets of the city. The physical heaps of waste gave visibility to the unspeakable origin of such plight, the ties between waste management and Camorra, the Neapolitan branch of organized crime. The accumulation of waste both on the side of the streets and in the press gave shape and smell to the corruption pervading the city, suddenly uncovering a problem that everybody knew about but easily swept under the carpet. Only a year prior to the outburst of the crisis, a young Neapolitan writer named Roberto Saviano uncovered the ways in which Camorra operated in his first novel,Gomorrah, especially addressing the problem of waste. The book soon became a national bestseller and turned Saviano into Italy’s most acclaimed writer. His act of disclosure gave worldwide visibility to the hidden problems of his city but also put his life under constant threat. However, the writer continued to read his writings in public, turning such events into collective awakenings where he was saluted as a national hero. In the meantime, the accumulation of waste started to poison the crops from the area and spread diseases among the residents, proving that Camorra could also kill without the use of guns. Improvised dumps along the streets reached the city centre and burdened the heart of Neapolitans as did the unburied plight of organized crime and Saviano’s written and spoken words, proving that some waste was just too much to dispose of. The final episode of Season 6 of the Thread is about the way we store ourselves. This show explores how, where and why we hold on to the stories, histories and memories that populate our private and public lives. We will talk with practitioners concerned with storing and communicating personal histories in the form of public archives and artistic production. We will examine how we construct personal identity when we face the loss of our memories, even our minds. Where do we turn when the storeroom of memories is raided by illness or trauma? Has the concept of identity become the perfect collator of our individuated existence or is it the ultimate dead repository of ineffable enigma. This entry was posted in Archives, Death, Human/Bodily, World. Bookmark the permalink.